It’s no secret that a great musician should expand and unfold himself more with each new album. When they are able to do that in multiple areas like songwriting, emotion, musicianship and authenticity, you’ve got a special album on your hands. The reflective moods and warm tones of Mission Bell, the fourth album from Philadelphian school teacher-turned-singer/songwriter Amos Lee, are the fortunate results of a year and a half of writing and an unexpected partnership with members of alt-country giant Calexico. With his bluesy folk swagger and unique voice that employs elements of Al Green’s soulfulness, James Taylor’s timbre and a little of Aaron Neville’s warble, Amos Lee has always had an R&B lean to his acoustic-led songs. However, for Mission Bell, he opened up that feel and added some new instrumentation with help from Joey Burns and John Convertino, both of Calexico. There’s no denying that the combined forces married together perfectly as dusty acoustic guitars, jazzy organ fills, shuffling drums, moving bass lines, laid back piano and an assortment of other instruments blend together with wide open spaces to create a depth and airiness for Amos to sing over. Each song maintains that comfortable, cohesive vibe while sounding different enough from the ones around it to keep things diverse and interesting. Mission Bell also hosts an impressive guest list that includes Willie Nelson, Lucinda Williams, Sam Beam, Priscilla Ahn, James Gadson and Pieta Brown. 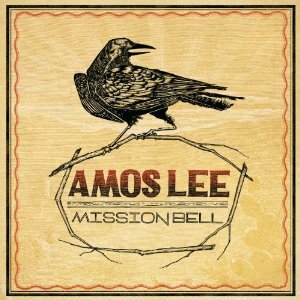 Although Amos Lee nails the soul-folk vibe as good as anyone else in the genre, Mission Bell shows that his talents run farther and deeper than just that. His ability to sound at home with gospel, country, jazz, blues and even some distorted alternative elements are showcased beautifully throughout the album. Fans of Amos’ first three albums will find much to love in “Windows Are Rolled Down,” “Stay With Me,” “Learned A Lot” and the album bookends of “El Camino” and “El Camino (Reprise)” with Willie Nelson. For those willing to let an artist stretch their wings and show different sides of themselves, Amos definitely has some tasty sonic tricks up his sleeve. The slinky slide guitar and harmonica in “Jesus” and the southern hymn feel of “Cup Of Sorrow” show two sides of his gospel influences. “Hello Again” has a south of the border flamenco groove to it with some incredible nylon-string guitar, vibraphone, trumpets and a bowed saw creating an awesome backdrop for the respectful kiss-off song. He even strikes up a nice alt-country atmosphere on “Out Of The Cold” and “Clear Blue Eyes,” a duet with Lucinda Williams. One of the most lush tracks, and my personal favorite from the album, is “Violin” featuring Sam Beam from Iron & Wine. A touching lead vocal from Amos, an ambient backing vocal from Sam, droning, distorted electric guitars, swelling pedal steel, gentle piano and a lazy drum beat mesh together to become one swaying sonic wave for Amos’ searching lyrics to weave in and out of. This one’s been on repeat for awhile. Mission Bell will definitely bring in a new audience for Amos while continuing to please his longtime fans as well. This is the kind of album that really solidifies the transition from musician to artist for an individual and it will end up being a standout in his catalog. Mission Bell will be released January 25th on Blue Note Records. Could not agree more. I have previewed many rough tracks from this album. It is a gem for those who appreciate the combination of singer and songwriter. The voice is silky while the lyrics pull you home to a place that is close to your heart. Violin and Windows Rolled down are ones that will jump out right away the flow is all Amos. We need to embrace is angelic voice and embrace the treasure that it is. Well done Mr. Hodge and well done Amos..